Updated: January 2019. I’ve loved orange tic tacs since I was little, so I’ve been a little afraid to ask, are tic tacs vegan? 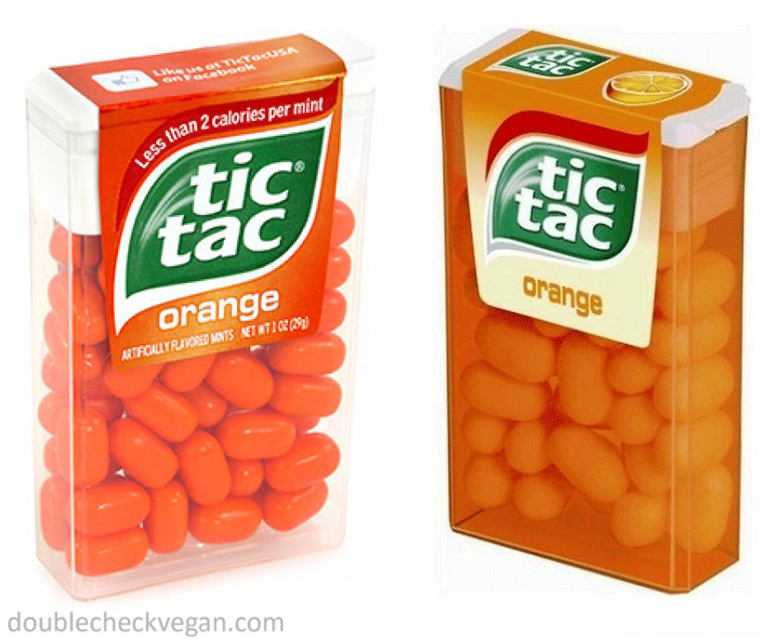 The answer is, most current orange tic tacs are vegan, and so are many other flavors, but some are not. It depends on which factory made the Tic Tacs – the same flavor may be vegan in one place, and not in another. For example, the Cherry Cola flavor on the USA website is vegan, but the one on the Australian website is not. Currently, the USA website only lists vegan flavors. However, some non-vegan flavors not listed are still available at stores in the United States. Carmine – a red pigment produced by boiling certain insects. Carminic Acid – the coloring agent in Carmine, a red pigment produced by boiling certain insects. Shellac – resin excreted by the female lac beetle, used to create a shiny coating on candies. It is now often replaced by carnauba wax. Milk – a fluid produced in the mammary glands of mammals intended for feeding their babies. If you’re shopping online, use our free vegan ingredient search engine to paste and search all the ingredients at once. Currently, any Tic Tacs with printed images on them, like the Despicable Me series, or the Valentine’s Day Be Mine Mix, use shellac, even if the base flavor is normally vegan. Cherry Cola Mixers Tic Tacs – USA version is vegan – check ingredients for carminic acid just in case. A reader commented that they found a box of orange Tic Tacs in Australia that contained Shellac. The Tic Tacs listed as vegan below are based on the most recent information available on each country’s Tic Tac website. As of December 2017 on the Australian Tic Tacs website, orange Tic Tacs do not contain shellac. However, previous formulas may have contained it, so always check the ingredients and watch out for the non-ingredients listed at the beginning of this post. I wish it was simpler! Cherry Cola Tic Tacs – UK, Canada, and Australian version contains carminic acid – check ingredients. United States version is vegan. Tic Tacs is a brand of small, hard, sucking candies, owned by Ferrero which is also the owner of Nutella, Kinder Eggs, and Ferrero Rocher chocolates. Tic Tacs were introduced in 1969. Around forty-five percent of the world’s tic tacs are produced in Cork, Ireland. The Tic Tacs sold in the United States seem to be made in Canada. What About Carcinogenic Food Colorings? 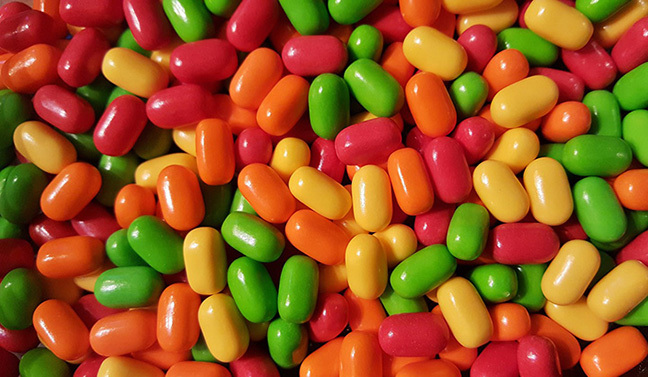 One of the reasons some flavors of Tic Tacs are vegan in the United States but not in other countries is because other countries have banned synthetic food dyes that are allowed in the U.S. Those countries end up using carmine made from bugs instead of Red 40 which is made from petroleum or coal byproducts. While carmine can cause severe allergic reactions, Red 40, Blue 1, and Yellow 5 have links to possible health risks including cancer and hyperactivity. However, in some of their newer flavors, Tic Tac has been using vegan and “natural” colorings such as beet powder and carotene, so it seems like pretty soon we’ll be able to have our cake and eat it too. In Canada, orange Tic Tacs are actually white, and they come in a see-thru plastic container. I’d love to get my hands on some of those. According to the USA tic tac site, the freshmint flavor gum contains gelatin so it is not vegan. I haven’t checked the other flavors. Hope this helps. The biggest question for if Tic Tacs are vegan is if the magnesium stearate is made from stearic acid from plants or animals. I have searched online and have not been able to find an answer. Has anyone contacted the company about this? I was disappointed to not find any mention of vegetarian or vegan on their FAQ page. I will follow-up and ask specifically where their Magnesium Stearate comes from. It seems like increasingly it is sourced from plants.